In our last article, we compared Poly Water Tanks with Galvanised Steel Tanks. In this article we look further into the features of galvanised steel water tanks. Numerous factors affect the life of a galvanised coating including environmental conditions, the usage of a product (e.g., roofing, sheds and water tanks), contact with chemicals and dissimilar metals, method of galvanised coating and the coating thickness. A more thickly zinc coated steel tank of 450 g/m2 would obviously outlast a thinner coating of 150 g/m2. It is also important to understand how contact with other substances and usage can impact upon the life of your water tank. For example, ZINCALUME® steel (a newer steel available since 1976) is said to last two to four times longer than galvanised steel roofs. When it comes to rainwater tanks though, ZINCALUME® steel cannot come into contact with moisture or it will corrode more quickly. ZINCALUME® steel needs to be surrounded by oxygen (air) in order to remain stable and prevent corrosion. It needs to be able to “breathe”. 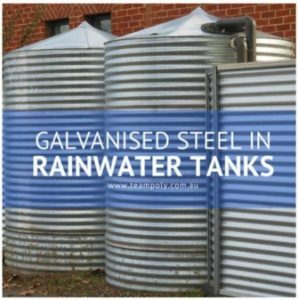 Given condensation can occur in a rainwater tank, it is probably true as some claim that a thickly dipped galvanised steel tank will last longer than your ZINCALUME® steel tank. Keep in mind that dissimilar steel cannot come into contact with each other. So if you have ZINCALUME® steel roofing, gutters or even treated timber then such will quickly cause corrosion to a galvanised steel tank. Vice-versa, it is important to keep copper and lead away from ZINCALUME® steel. Today, galvanised and other steel tanks come with an inner poly lining. This provides additional protection to the steel tank from the rainwater stored within causing rust and corrosion. It also helps to prevent leaks at welded joints, which can be a weak point in steel tanks and a cause for water leaks. The inner poly lining in galvanised steel tanks also stops zinc leaching into your rainwater. Zinc gives your water an unpleasant metallic taste, but is otherwise safe to drink. Despite newer steel materials on the market, there are some companies that specialise in more thickly coated galvanised steel. These will often last just as long as the newer steel tank materials, especially since the inner poly lining provides much protection. Care must be taken however, to ensure roofing and gutters aren’t made from ZINCALUME® or an incompatible steel or your tank will corrode. Always examine the warranties closely, as often such fine print reveals the weaknesses in the tank material in how to properly install and maintain your tank. For an in-depth comparison of galvanised steel water tanks versus poly water tanks, read our article Water Tanks Compared: Poly Tanks versus Galvanised Steel Tanks.